The Balkan Mountains and Danubian Plain meet in the Lovech Region. Its fertile plains and hills offer refreshing views of the Vit, Osam, and Vidima Rivers. The region has eight nature reserves, including Boatin, Tzarichina, the largest part of the Central Balkan National Park, and Steneto, which is one of the largest reserves in the country. Karst springs are abundant, particularly the Glavna Panega near the village of Zlatna Panega. Lovech is rich in cultural monuments: some from Bulgaria’s National Revival Period, some from medieval times, and many from even earlier in the country’s history. Artifacts from the Paleolithic Age have been found in the vast and remarkable Devetashka, Sueva Dupka and Vassil Levski Caves. Ancient Thracian art and artifacts have been found in the region, most notably the cache of silver items discovered in the town of Lukovit. There are also the Troyan and Glozhene monasteries, and the historical reserve of Varosha (which means “old town”, and is the name for the older parts of several Bulgarian cities). One of the most popular of Lovech’s more than 600 architectural treasures is its famed Covered Bridge, originally built by the master builder of the National Revival Period, Kolyu Ficheto, over the Osam River. Aside from its scenery and multitude of cultural sites, Lovech is building the Balkans’ biggest casino, hoping to fill it with the glitz of high rollers. The Pokritiq Most or Covered Bridge over the Osam River is one of Lovech City’s most well-known landmarks. It was originally wooden, but after it was swept away by the water, rebuilt, and then destroyed by fire, the newest incarnation was built out of iron and concrete as well as wood. It looks like a house that’s been stretched out over the water, with walls, windows and a sloping roof. Inside, shops and cafés flank the walkway. Crossing the Covered Bridge from the centre will take you to Stratesh Park, the highest part of town. The park has a zoo, an old castle, and is covered with lilac bushes, for which reason Lovech is also sometimes called “the town of lilacs”. Every spring, a music festival called the “Lilac Music Days of Lovech” is held. Lovech’s old quarter, or Varosha, is an architectural reserve. 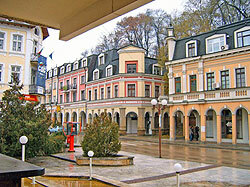 Lovech’s economy appears to be set to rise, thanks to some new developments. Recently, a Chinese automaker in partnership with a Bulgarian motor company announced plans to build a plant in Lovech. This will generate more than a thousand new jobs in the area. The biggest casino in the Balkans is also being built in the city.